Drive this amazing truck, but first choose the mode you wanna to play. You will be in the cool place, like the real desert, where you can also enjoy the landscape. Are you ready? So, invite your bests and show them who is the best driver! You will cope with it! You have a great chance to race along the countryside, through the desert, and even through snow-covered trails, could you believe that? Just choose this challenging game and beat all your opponents. You have to compete against opponents, or complete the crazy challenges, such as chasing down ninjas, outrunning a giant football, or dodging homing missiles. 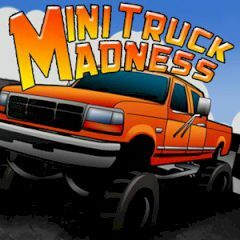 By the way, you will earn money to upgrade to your truck, or unlock new trucks and win this exciting game. Are you ready for that? So, use arrow keys to play and good luck to you.